It’s nice to imagine a friendly neighborhood hangout spot where the drinks are always cold and, the food is delicious. A place you can unwind after a long day at the office or bring your family to grab a quick bite to eat. That’s what makes opening a bar and grill so appealing. You want to create an inviting and friendly atmosphere — a place you’d go to dine even if you weren’t the owner. Opening a restaurant may seem like a fun and exciting idea at first, but it takes the right kind of entrepreneur to make it sustainable. An idea is only going to get you so far; you need to have a plan. A bar and grill business plan will get you on the right track to a prosperous future in the food and beverage business. Let’s take a look at how to craft a killer business plan and the essential information you should include to impress potential investors. Every business plan needs to have an executive summary. Although this is typically the first section of the document, it’s often written last because it needs to incorporate multiple elements of the business plan. The summary is a critical part of any business plan and something many consider the first impression. You want readers to be engaged by the content – especially if you’re writing a business plan to attract investors or lenders. If you’re writing for specific stakeholders, make sure the language and information are tailored to your audience. Your readers may have little or no experience in the restaurant industry, so make sure to write in a clear and concise manner that is easily understood. It’s best to avoid using industry-specific or technical jargon and only highlight the most critical points of your business plan and leave out less important facts and materials. Your competitive advantage; what will make your business a success? Although it may not seem like it, a company description is one of the areas of a business plan where you can get a little creative. It’s no secret that people connect better with stories and lifestyle than a boring list of facts. Just take a look at any of the most successful ad campaigns by major brands; they’re all trying to appeal to the consumer’s lifestyle by telling a story. Don’t be afraid to tell the story of “why.” Why does your business need to exist? The answer to that question can lead you to find the core messaging to help connect with consumers and investors on an emotional level — and that’s hard to ignore. Legal formation, or business structure as we referred to it in the previous section, is your first order of business (pun intended) when starting a company. The reason is that Uncle Sam needs to know how to tax your business when you apply for an EIN (employer identification number). Choosing a business structure for your bar and grill is a decision that you should take with a grain of salt. Deciding how to structure your business will impact not only your taxes but also the amount of personal liability you and any potential partners have to the company. Sole proprietorship – This is the simplest form of legal business structures — one individual is responsible for all of the company’s profits and debt. It’s ideal for owners who want complete control of their company, but it also means they won’t have separation from personal or professional assets. The sole proprietor is personally responsible for the business, thus takes on all the liability. Partnership – Two or more individuals own the company and agree to share in profits and losses. They not only make decisions together but also share in the liability of those decisions and other partners’ actions. Corporation – A business entity in which the company income is taxed, not the personal owner(s). Legally, owners are viewed separately from the business as shareholders and don’t carry the same level of personal liability as a sole proprietorship or partnership. However, corporations are subject to double taxation of profits – company income, and shareholder dividends. S Corporation – Within the S Corporation structure, the company’s income is passed through shareholders proportionate to their investment and taxed at personal income rates. S corporations can only have one type of stock and a limited number of shareholders. Limited Liability Corporation (LLC) – A hybrid form of partnership that allows owners, partners, and shareholders to limit their liability while also being able to enjoy the tax and flexibility benefits of a partnership. Its advantage is that personal and company assets are separated, and company profits and losses are not taxed as heavily as a corporation. To decide your legal business structure consider your business’s needs, risks, constraints, and the ability to grow. Each business structure will impact your business differently like liability, taxes, and overall control of the company. Choosing a legal formation is central to your business plan and must be chosen wisely. Once you select a business structure, it’s challenging to reverse or switch. Whichever you prefer, it needs to align with your business plan so that your intended goals are within reach. In your bar and grill business plan, you’ll want to state how you’ll acquire the proper licensing and permits to open for business. Unfortunately, obtaining these authorizations is often a long drawn out process because you’re dealing with state or federal entities. Permits, licenses, and inspections will vary depending on the type of restaurant you own and the local regulations. Check your local municipality for a complete list. Every business needs financing; sometimes a little, sometimes a lot. Regardless of how much startup money you need, it’s important to outline how you plan to fund your new company. You also want to define how you’ll use the finances. For instance, how much money will you need for inventory or to cover bi-weekly payroll? It’s common for new entrepreneurs to look for outside investments and loans to start their food and beverage business. Moreover, this means it’s critical to do your research, so you know exactly how much funding you’ll need and stakeholders better understand the numbers behind your business concept. Providing this information will show investors and lenders that you’re focused on sales as well as equipped to take action with your projected retained earnings. Now, it’s time for the fun part of writing a bar and grill business plan — discussing your products and services. Describe why the market needs your type of establishment and how it will compete with established restaurants. You want this section to be exciting and showcase the uniqueness of your business. Do you offer a new cuisine that’s not currently available in the community? Is the dining experience exceptional or unique? Also, demonstrate that you have expert knowledge and experience to make your business thrive. Show them that you know all the ins and outs of the industry and how the business will provide value to customers. You will also want to detail any patents, copyrights, or trademarks you own or have applied. Stakeholders want to know how you’re going to obtain the products, materials, technology, and equipment you’ll need before you can open for business. Oven, stove-top, fryers, and grills. Small kitchen items like dishes, utensils, cookware, and, glassware. In this section, you’ll also want to tell your audience about any technology solutions you plan to implement. Solutions such as a point of sale (POS) system are table stakes for just about any type of restaurant these days. Therefore, you want to include an estimate or actual cost of a POS system. You’ll also want to include any other solutions such as online ordering or reservation management since there will most likely be a fee for these too. Lastly, list suppliers in this section — especially the ones you plan on using on a recurring basis. Restaurant supply companies vary in price and terms, so it’s important to do your research before making a decision. It’s also worth mentioning any less conventional methods such as growing your seasonal vegetables or working with a local farmers market. An analysis of your target market is the best way to begin developing your market positioning concept – which we’ll discuss further below. 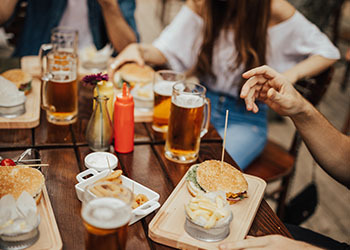 The objective of your market analysis is to gain a thorough knowledge of the ideal groups of people you think will get the most value out of visiting your bar and grill. For marketing efforts to succeed, you must understand the wants, needs, and interests of a target market to skillfully craft a successful marketing strategy. Identify, compare and contrast competitors’ strategies. Research both their successes and failures, how they are attracting customers, and why customers are choosing to visit their bar. It’s important to see how many patrons visit on a given night and what customer type is attracted to that bar environment. Find places where their strategies fall short and try to capitalize on it. Analyze your business’s strengths, weaknesses, opportunities, and threats – also knowns as a SWOT analysis. The goal of a SWOT analysis is to be completely aware of the affordances and constraints surrounding your business plan implementation. It focuses on the positive and negative dynamics of a company, so the marketing strategies are communicated effectively. It’s beneficial to identify these factors to ensure resources can be assigned to fix problems and measures can be made to reduce or abandon potential threats. Also, include an analysis of the bar and grill industry. Provide detailed statistics and figures about the industry’s growth rate, trends, and outlook. Investors will want background knowledge of the industry’s life cycle and its potential for success and growth in the future. The next section of your business plan will summarize your brand positioning concept. Developing a brand position means creating an image or identity that consumers can recognize. Brand positioning influences customers’ perception of your brand relative to other businesses in the market. The best brand positioning strategies enhance marketing efforts by making consumers aware of your product or service and motivate them to purchase. Many companies establish their strategy with a positioning statement – a concise description of the target market and an image of how the business will be perceived. Every marketing decision made must align and support this statement. A positioning statement should act as a guide for your marketing efforts to maintain the focus of your brand. When developed correctly, your marketing strategy will identify how to reach your target customers and retain them for future visits and purchases. Your marketing strategy will be the roadmap that drives your restaurant’s success and growth. Developing a bar and grill business plan can be a challenging task, but when done right guides you through starting and managing your business. It can be helpful to read through completed plans from other companies within and outside the industry. Numerous online platforms also offer free downloadable business plan templates. Good luck, future restauratrepreneurs!